git publisher pushes to early. Whe've set git publisher to push only when build succeeds. The problem is that when the git publisher checks whether the status is succeeded this status can be still be changed, by test results or fxcop for instance. 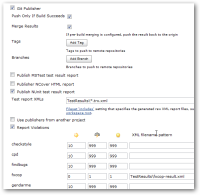 Would it be possible for the publisher to be the very last task after build. I've added the config and a result in the attachments to clarify. Andrew Bayer added a comment - 2010-10-28 15:00 Resolved in upcoming release. Seems reasonable - it's not 100% guaranteed, but I can set the Git publisher to run after all post-build plugins that don't specify anything in re: build ordering. I'll get that into the next release. Andrew Bayer added a comment - 2010-10-28 14:30 Seems reasonable - it's not 100% guaranteed, but I can set the Git publisher to run after all post-build plugins that don't specify anything in re: build ordering. I'll get that into the next release.